Let’s see when and how each fee available in the system applies. Proceed with : Company panel > Service Types > select a particular Service Type > Fee settings > CANCELLATION POLICY. The system charges a passenger with a booking fee when driver accepts the ride. It is possible to take the fee only from a credit/debit card. Booking fee always goes from passenger’s default credit card onto the company’s merchant account. Please note that in “no driver found” cases a booking fee will not be charged. If passenger linked no credit/debit card to the account nothing will be charged either. Booking fee data is visible only in service types tab of your company panel. You can check the fee charges in the payment report. Neither driver nor passenger will see booking fee information in trip summaries and their apps at any time. 1. A passenger is charged with the fee in case he cancels an order after its acceptance by the driver. 2.Cancellation fee also applies in cases when a driver confirmed his arrival to pick up point but passenger does not appear and driver selects “No passenger ”. “No passenger” can be selected once the “Minimum waiting time for the passenger” runs out. 5 min is set as default waiting time value. “Minimum waiting time for the passenger” can be decreased or increased from 1 minute up in Fee settings > Cancellation policy of each Service type. The charge does NOT apply if a passenger cancels the trip when driver is late for more than 3 minutes and distance from driver to pick up/passenger location is more than 200 meters. These values are default and can be adjusted in Cancellation policy as well. 1 min is minimum allowed in “Waiting time for the taxi”. 0.1-0.5 km range is possible for “Minimum passenger pickup distance”. Passenger cancellation fee can only be set for companies with active merchants and credit/debit card payment methods enabled. In this case the fee is charged from client’s default credit card linked to his profile. The fee is credited to taxi company merchant account on condition a passenger’s default credit card is charged successfully. If transaction fails due to any reason cancellation fee is not charged in any way. Passenger cancellation fee value is credited to driver’s balance minus the commission as per driver’s subscription. 1. The fee applies to the cases when a driver cancels an order after accepting a job. 2. The system will charge the driver when passenger cancels an order informing that there is “No taxi”. “No taxi” situation means that driver is late for more than 3 minutes after estimated time of arrival (pickup time for pre-orders) and is farther than 200 meters from pickup/passenger location. 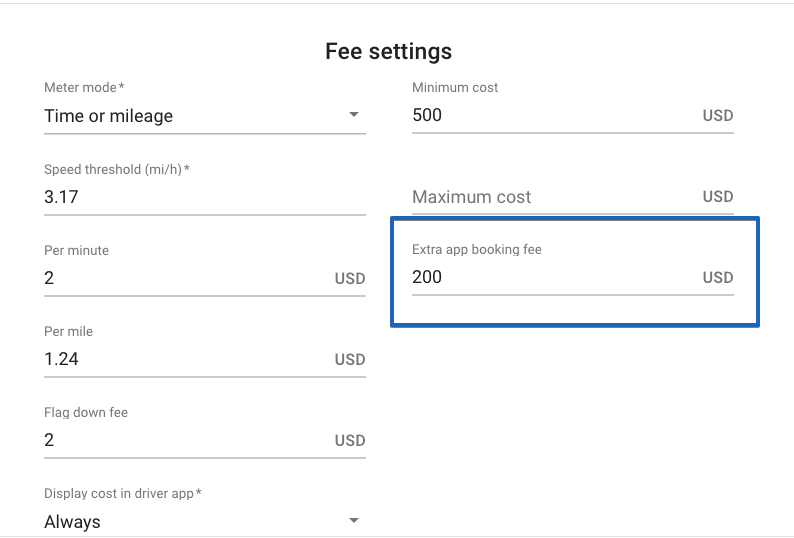 These values are set as default in Fee settings > Cancellation policy and can be adjusted: 1 min is minimum allowed in “Minimum waiting time for the taxi. 0.1 - 0.5 km range is possible for “Minimum passenger pickup distance”. Driver cancellation fee is taken from a driver’s balance. Fee is registered as a transaction against driver’s account. System does not charge the fee from a driver’s credit card. Cancellation fee calculations are included in the trip summary and are clearly stated in both Passenger and Driver apps. Now you are fully equipped with the knowledge of fee configuration for your company!